New digs means a new look...no I didn't color my hair...I've got a new studio and in honor of Chicago, my new home...a new look for the blog. I'll always be Tallgrass Prairie Studio, but I wanted a sophisticated, modern, city look and my friend Sarah took on the challenge. (and I mean challenge...I struggled making choices on this one!) I love what Sarah did. It's so me and it's so inspirational. Perfect, simply perfect! I hope you all like it too. The studio is about ready! It's a tiny bedroom, so I pulled out every organizational trick I had to fit everything and still make it work as a place to sew. The ceilings are very high so whenever I could I went vertical. For a short gal, that's a challenge, but with stepstool at the ready, I can do anything! My sewing table fit perfectly (with mm to spare) into this alcove. Yoda is there as always to watch over me. 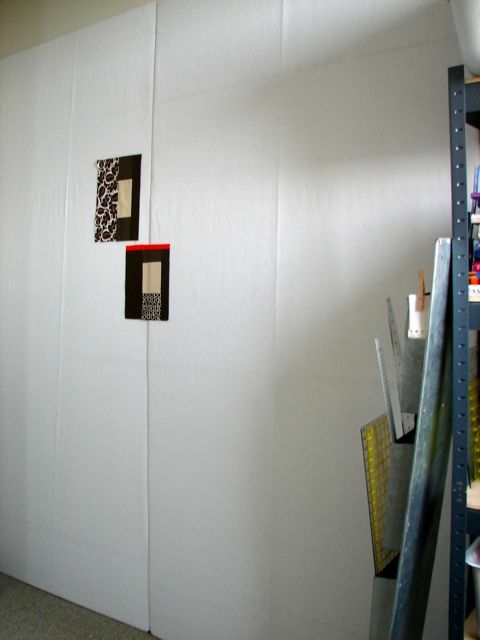 I covered two 4 x 8 sheets of foam insulation board for a design wall. Gotta have it! 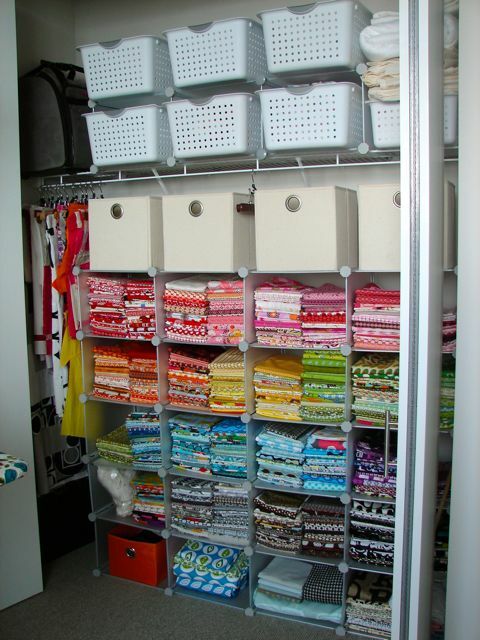 The closet is for fabric and project storage. Again, I went vertical. The 5 shelf industrial shelving units aren't really pretty, but they were only 39 bucks and they are tall and give me lots of extra storage. Where did I get all this stuff? I repurposed things from the old house for new jobs. This magazine rack is now holding my rulers. It's nice to have familiar things like my dad's thread cabinet and things from the old studio to make me feel at home. 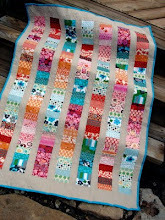 Kajsa's tomtar are there to remind me of my blog friends and how blessed I am to be a part of the quilting community! I will miss my big orange cutting table, but you make do with what you've got, so it's time to fire up the machine and get sewing! Have a great weekend and I hope you get some sewing done too! I'm a happy city girl! nice new digs. I recently had to downsize my sewing space, and although I miss my bigger cutting table, I always cluttered it up anyway. I like your vertical storage. Part of being creative is using what you have, which you've done with great success. Congratulations on your new home! It looks great, and I love how you have organized everything so creatively. Hope you are enjoying your time in the city! It looks wonderful! Have fun in there! I love your new space, but physical and virtual! I hope the move went well. I was just thinking about you the other day when I was going through my blog roll. You got to Chicago just in time for fall, huh? Love the new logo! Looks like a great space to get creative!! Love the new logo! Orange and grey are a wonderful combination. Your new studio looks great. Those shelves look like they hold a ton of stuff. it looks great! the blog, the room... all of it! congratulations! I love the new look to your blog, very big city Chicago! 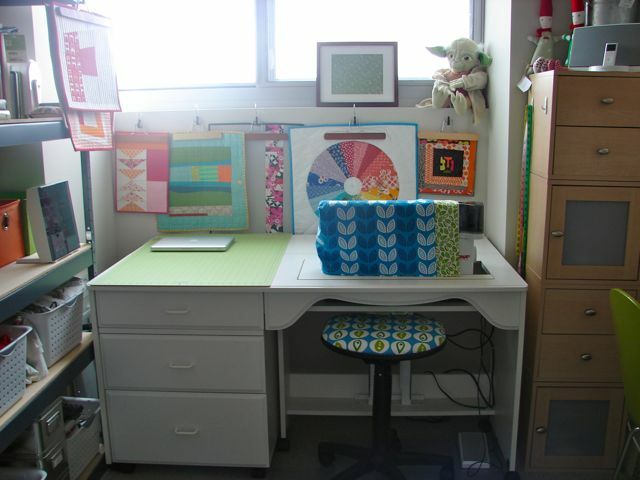 Your sewing room is really coming together. Mine is a small bedroom too and I may steal some of your ideas. How thick is the foam board you used for your design wall? If you do any workshops in the Chicago area let me know. We are going at Thanksgiving to see our daughter. Somehow I just knew that you'd have make some changes to your blog look! I really like it! Great job on making the space work. Now you'll be able to enjoy creating again. Enjoy. the new logo/header is just fabulous and perfect. The blog looks fantastic.....the new space looks great as well. New blog looks wonderful! And you took no time at all to discover all that space up to the ceiling. 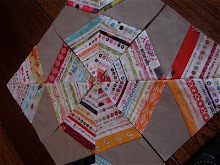 :) I have miniscule space left like that, and I'm just about to use the last of it with a small quilt to hang. It's true about the large worktable. I, too, only really use a part of it for cutting.....the rest of it is part-time storage. I love the new design!! Very modern and very striking! The new space looks great too..you are sooooo organized!! That, my dear, is awesome. Welcome to your new home. Looks like you will enjoy your new space. Here's to new beginnings! While contemplating a move to smaller digs, this great post encourages me. If we do it, we will also have tall ceilings. Thank you for the photos... I feel a lot better about my concerns for the possibility of being in a smaller sewing space! It's gorgeous and functional. What more could you want? ('Cept an orange cutting table.) And I love the repurposed mag rack. Love the new studio - it looks great! I also love the wonderful new look to the blog! 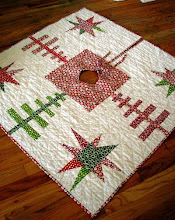 The blog looks amazing and the quilting space is awesome!! I never thought to use a magazine rack for rulers...genius! Beautiful and very modern. Love the new look! I'm thrilled that you are settling into your new space. It must be feeling like home with your sewing studio coming together so nicely. I love the modern vertical look! I love your new studio and I love your new look. Best wishes for a lot of great creating!! Well you made the best of it!! It looks to be very inspiring! Great new look! Great designer! Love, love, love the new logo/header. How much did she charge you? I would really like to get a logo made for my own blog. I am amazed that you got it set up so quickly, as well. No doubt, you will be achieving great things in that space and I can totally see you sitting there. Glad the move went well and so pleased to see you up and running! 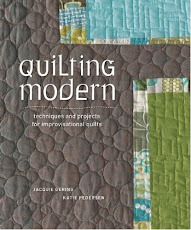 Congrats on your new space, Jacquie! It looks fabulous! I can't wait to see what kinds of inspiration the city is going to give you. Craft well! Look what you did!! It looks amazing! and the light, wow!! Happy New Digs! I love the new header! 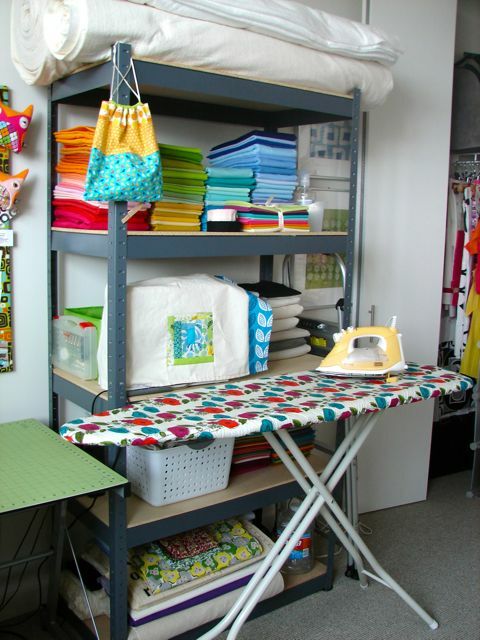 You did such a great job on your new space have fun sewing! Welcome to Chicago! I am happy the move went well and your studio looks wonderful. I think your new look is fabulous. You have settled right in and made this space "your own' good for you! 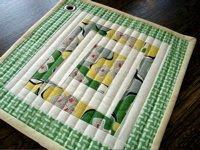 I can't wait to see how your quilting ideas change with your new environment. Love the new look and great job at the organization in your new diggs. Looks good. I'm one that has that vertical storage down myself. I had hubby install a wide shelf on three of the walls in my sewing room. The 4th wall he built a nice shelf to hold my big tv up and out of the way. The shelves on two walls actually meet in the corner so they wrap around two walls which is nice because where they meet in the corner of the room that area is a bit wider going back to the corner. I've got my Container Store storage boxes stacked two high on two of those and half of another with the rest of that one holding magazine storage boxes and one of those have all my Husqvarna instruction books in them. I have no wall space anywhere now because there are now two walls with lower shelves installed too. LOL I have a long hallway outside my room which may have to become a design wall when needed I think. OR the back of my almost to the ceiling bookshelf could be used too. I'm glad to see you're getting all unpacked and are ready to get back to having fun. I'm sure it's been a huge amount of work. I replied back to that last email and had a bunch of links in there. I wondered if you got that or if all the links made that end up in the junk box possibly. NO hurry to reply as I know you're busy...just wondered if you had gotten that or not. I included a lot of info for you so I am hoping you did get it is all. I absolutely love the new logo and look! 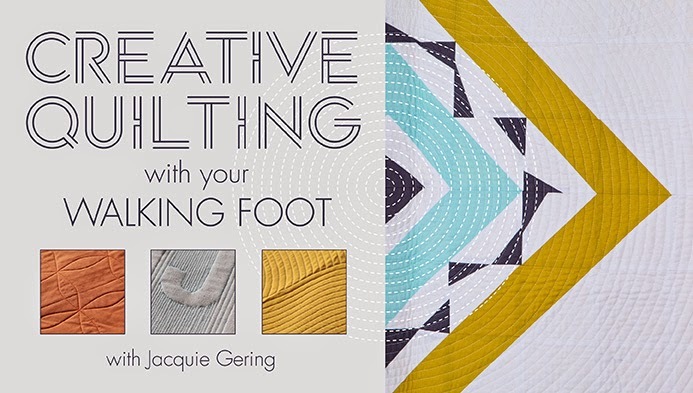 It's fabulous - it definitely fits your quilting. I am so glad to see that you are back to it, the studio looks great! Your space looks "fabulous" Jacquie! Glad to see you are ready to create again. Omg how long will those fabrics sat neatly stacked??? I'm in awe! Mine would last about 5 mins!!! Nice to hear from you Jacquie! Looks like you are getting settled in and ready to create! Love the new look of the blog and great use of the space you have. I see great projects coming. Thank you for sharing photographs of your new studio. Lots of great storage ideas! I look forward to seeing all your new creations. Good luck with your move to Chicago. We hope you will love it there. Is that Gabriella's bag hanging on your shelves? How sweet that you still have it. Before long it will feel just like home and you'll be pumping um out again in your truly awesome fashion. Can't wait to see what's next! Love your new logo! You have acquired the city knack of careful placement and solid organization. You have light and a design wall. Your creative juices will be overflowing out of that studio in no time. Thanks for sharing your space with us. Love the new look! 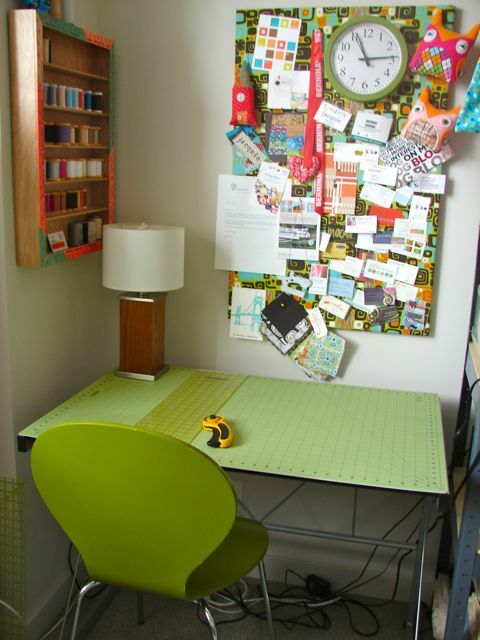 I really like your sewing table-I need one that has an insert for my machine. Curious where you got the cubbies in your closet? I love your new header...it's a perfect Chicago image. That or Buckingham fountain but then folks would think you were back in KC! And everything I. Your studio looks ready to go, I'm envious. My should look so good even with out a move. Happy sewing in your new home! I can't wait to see how the big city influences your work. And love the new logo! 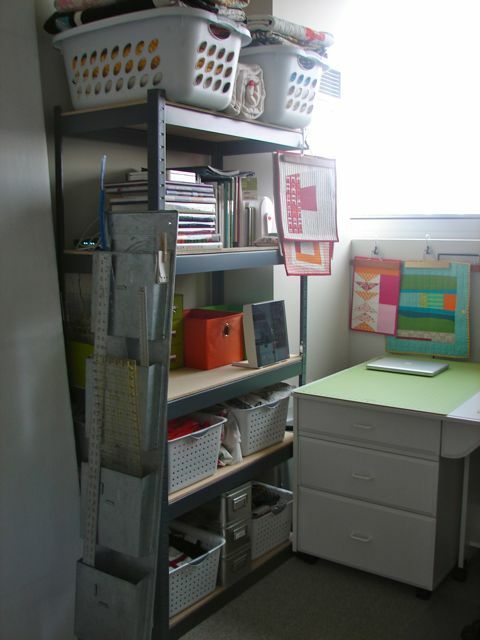 Lovely space and great reuse of things to stay organized. I LOVE your new header. It's so fresh and clean. I feel kind of weird saying it but I struggle with living in a house that has too much space! I wish my place was smaller so I had to be more creative about storage. You've done well! I'm so happy that you are getting settled in and getting that sewing studio together will help make you feel more "at home". Your new header is so "YOU"! Seeing your new studio and blog banner makes me want to a) redo my blog - scheduled for Oct and b) reorganize my studio - always a work in progress. Congrats to you on both your achievements; looking fwd to seeing what you create in the windy city. A great one, too. 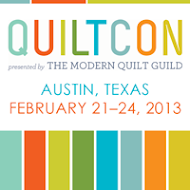 And just think: come those Chicago blizzards, how much cozy, sewing fun time you'll have. Enjoy! Your new look is simply perfect like you said, and very you. Your new sewing area looks lovely. Enjoy your new space. 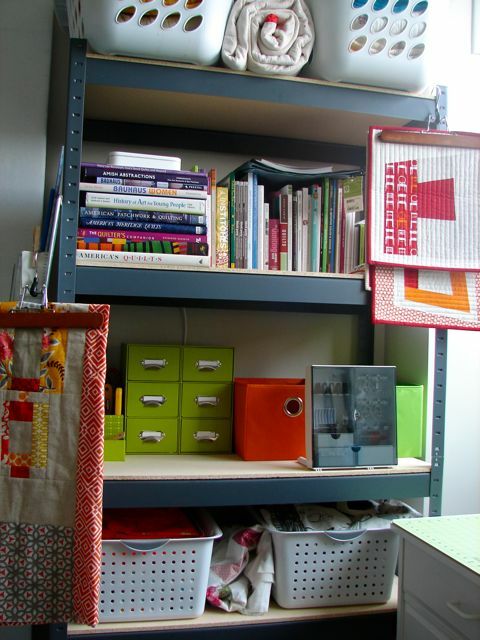 I love your new sewing space and the industrial shelving is very Chicago to me. I am looking forward to what city life inspires you with. 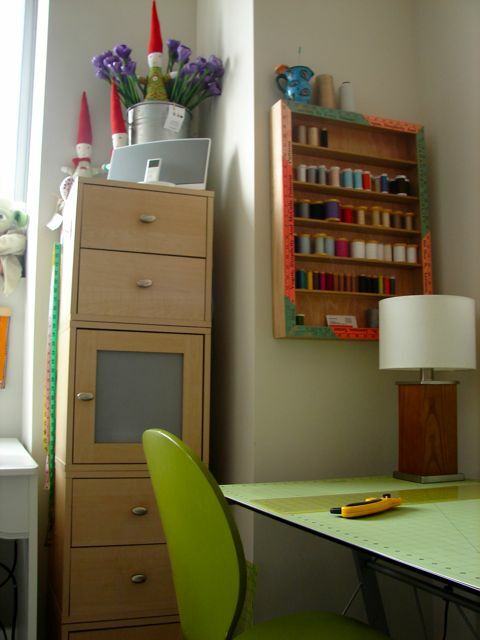 Great city sewing space! I went to college in Chicago and it holds a very dear place in my heart. Good luck in all of your city adventures. I absolutely love it there and I bet you will, too! Plus, who doesn't love a view of the Sears Tower?? I loved the old logo and I really love the new one! It;s a fabulous idea and way to embrace your new life positively. Well done! I can see you are settling in to the new digs just fine! Looks like a fine origami job was done in your sewing room. Maybe I will get a chance to check it out in the near future. Wow Jacquie, I'm feeling a tingle of excitement too!!! What an adventure this will be!! Your view is crazy wonderful and I'm impressed with how quick you got your new studio up and running!! I am wishing you well and I hope it won't take you too long to feel right at home!! Your new blog changes hit the spot just right!! 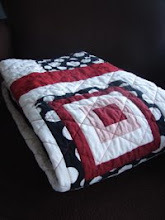 I love the new look of both your blog and the sewing room. Great new looks--both the blog header and your new sewing space. Once you actually start sewing, I'm sure it will feel more like "home"! Welcome to Chicago! Although I don't live there anymore, it is my hometown and I think you will love it there! And I love how you've organized your sewing space - your fabric stash looks so fun, as does the rest of the room and I love all the colorful touches! You really rose to the challenge there! Looks great! What an inspirational studio! Congrats on the move. I can't wait to see what new inspiration you find and how it will present itself in your work. Where did you get the 5 shelf industrial shelf for so inexpensive? I would love to get rid of all my dressers that I can't see what is in them and buy 3 of those shelves. Please give me a place to start looking!! I love your room! I am going to see if I can go backwards on your blog and see your old 'big' room. I have a bedroom with a long closet and it's cram packed. I wish I could knock the wall out between the other spare room and make one big sewing room, but my husband still doesn't quite get my quilting. He thinks I should be selling my quilts. He said I put so much money into my sewing machine ($10,500) and lights and irons and everything else, which I have everything you can think of, plus I hoard fabric, that it's a money trap. I finally figured out too respond to him by saying "You spent so much money on fishing rods and reels and clothes and gear and a pickup and you don't sell your fish". He finally understood me. It's my hobby! I don't want a job anymore. 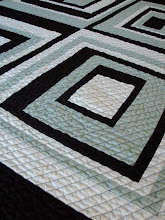 I will never make a quilt that someone asks me to make.